It’s beginning to look a lot more like fall at our house! All the trees are changing to their lovely autumn colors, and there is a hint of coolness in the air. I love this season–especially all the delicious things you can make with pumpkin. Last week I made pumpkin bars with cream cheese frosting to take to a hot dog roast, and it was so festive to be sitting with friends around a fire roasting hot dogs and marshmallows! After dark the children played games while the adults sat around the fire. Later, one of the young men got out his guitar and we sang some hymns. There’s nothing like singing together by the fire with the moon and the stars out! I’ve seen so many wonderful-looking recipes using pumpkin lately, and I can’t wait to try some of them. For now, here’s one we like to make. Not really dessert–we eat these for snacks or breakfast occasionally. Combine dry ingredients in a large bowl. Combine the liquid ingredients in a separate bowl. Add liquid mixture to dry mixture. Stir until the batter is smooth. 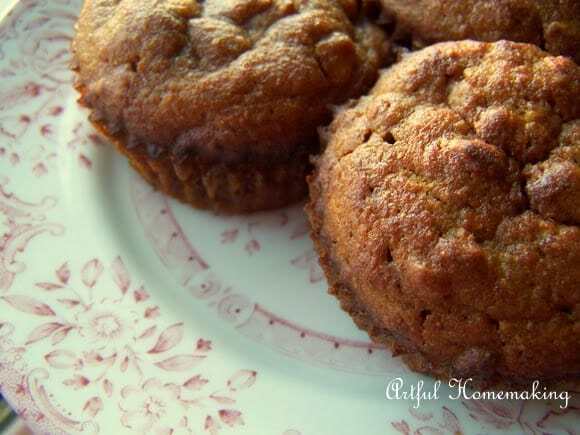 Divide batter into greased muffin cups. Bake at 400 degrees for 18-20 minutes. Your muffins sound delicious! Thanks for sharing with Party in Your PJs! Sorry you can't have oats! Joy- I was on it this morning and already made these. YUM!! I did use regular oats (from Azure!) and they were just fine. I just may have to make those today! They look amazing! I'm looking forwared to sitting around the fire this weekend for our church bonfire. Your evening sounds lovely. I will for sure have to try these. Loved hearing from you! If you try these I hope you like them! We don't usually purchase quick oats, either. We get ours (the old-fashioned kind) from Azure Standard (natural food co-op) in 50-lb bags. It probably depends on the kind of oats you have (I may have had the rougher steel cut oats on hand), but the last time I made these with old fashioned oats, the oats seemed kind of coarse and not soft. I don't know why because I think I've made these before with the old fashioned oats. I have been thinking of trying to soak the oats beforehand, which would serve a dual purpose of softening them up and also making them more digestible (Nourishing Traditions). Your evening with your friends sounds so delightful, Joy! So glad that you were able to enjoy that. And thank you for sharing this recipe. I look forward to trying it! The time spent by the fire must have been really sweet. A true enjoyable time with friends praising Our Lord.